Canisters come in very handy to store various things and keeping them safe from dust and dirt. If you are looking to buy one, get it from Giftwrap and make use of this handy tool. 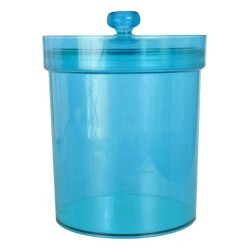 The canister with lid that is available on Giftwrap can serve multiple purposes for you. It is available in different colors and can fit in anywhere in your home or office to store things and cover them from different atmospheric elements. Aren't we always looking for canisters that would keep our things safe and fresh? These multi-purpose canisters come with lids and are good for personal and professional uses as well. They would look as good on a kitchen shelf as they would sitting on an office table. We at Giftwrap offer you canisters with a wide range of color options to choose from. Not only are they great for personal use but are great for giveaways as well. If printed with a logo or a brand's image, they would make up for an ideal corporate giveaway. Get hold of our team today to find the color that represents you well.